Wait what just happened I blacked out. Seriously though, wow. Last weekend was a phenomenal experience. 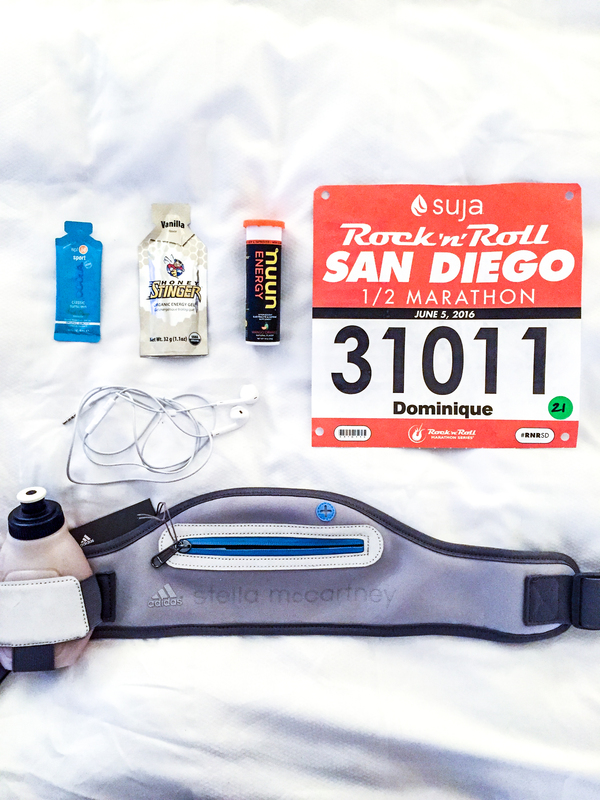 After having participated in multiple Nike events, the bar for half marathons has been set pretty high — but the Suja Rock ‘N’ Roll Half truly went above and beyond expectations. Despite a complete lack of training (approximately 5 or 6 runs in total . . . whoops), Arielle and I somehow managed to survive. I attribute the majority of my success (read: resistance to death/body failure) to the consistent workout schedule I’ve been on (read: lots of SoulCycle). Cardio and strength training have been super crucial for increasing endurance, lung capacity, energy levels, and overall strength. I don’t remember a single time during these 13.1 miles in which I felt overly winded or out of breath. THAT to me is worth more than a PR. And that is fortunate, because we definitely didn’t PR on this race. A slow and steady 12-minute mile pace was exactly what we needed to keep chugging along without stopping. The even, laid back tempo let us enjoy the miles, stay moving, and avoid any injury. That said, with no training, there’s only so much you can do to keep yourself feeling good — at a certain point (and distance) you’ve eventually invited in pain, soreness, and achy joints. Please, have no sympathy for me, I did all of this to myself. At the finish line we quickly inhaled a banana and chocolate milk (as per usual) and headed straight for the medical tent. All of the ice, all of the numbing spray, all of the chairs. Fortunately my dad used to be a paramedic and was waiting for Arielle and me at the finish line, ready to wrap our extremities in ice and plastic wrap. After a bit of icing, LOTS of BCAA recovery drink, some yoga, a massage, and a whole lot of sleep and taking it easy, I’m feeling good as new. Let’s review some aspects of this race, in case you’re preparing for your own half marathon, or looking to try this particular event next year! Belt: I used a new belt, for the first time, which very much like skipping training was a bad idea that I knew was bad ahead of time, but continued anyway. The belt itself is really cool and sleek — I mean, it’s Stella McCartney for Adidas after all. But I think I’m too small for this kind of belt, as it kept riding up, and I was pulling it down the ENTIRE TIME. Also, the little water bottle fell out a couple times, which was frustrating, as I had to go back and get it. Since the majority of people on this planet have a somewhat larger build than mine, this belt could absolutely work for you and have a snug, secure fit. I sadly did not have said success, and will likely be sticking to my Nike waistpack. Gels: Since I was unfamiliar with the gel sponsor (Glukose), I stuck with an old favorite and got myself a vanilla Honey Stinger pack. I was SO glad I did! As far as gels go, this one is really delicious; it’s essentially like vanilla flavored honey. The ingredient list is short, and it’s 95% organic. Unsure about the other 5%. Could be arsenic. Electrolytes: Before we left the hotel, I cracked half a Nuun energy tablet and put it in my tiny water bottle. The mango flavor was great, as was the burst of caffeine and surge of electrolytes. Headphones: I would’ve loved to use my wireless Powerbeats2, but unfortunately my phone has been dying when I have it on Bluetooth, even with over 60% battery. Verizon sent a replacement phone, that was locked and tied to another Apple ID, and apparently I won’t have another phone until next week. Fuuuuuun tiiiiiimes. That said, my Apple earbuds did the job! My Music: This time around, I feel like I finally set up a good race-day playlist for myself, in which I didn’t have to skip any songs. Check it out. BodyGlide: The lady version of body glide has lots of extra moisturizer in it. You can use it under sports bra seams, on the insides of your arms and legs, etc, to prevent chafing. I’m not sure if I necessarily NEEDED it but it definitely didn’t hurt. SPF: I tried a sample of Coola fresh mango SPF 50 sunblock, and it was great. Smelled awesome but not overpowering, felt light on my skin; zero sunburn to report back. Tracker: Although until recently I’ve never worn a Fitbit or tracker, I happened to get a sample of the Adidas miCoach watch, which has a heart rate monitor and pedometer. The GPS was really gratuitous, and told me I ran 15 miles, which I felt good about. The part I love about it most, though, is the heart rate monitor, which has been helping me be more aware of anxiety and stress. Top: Lululemon Swiftly Tech Tee ($58). I happened to grab mine when this color was on sale! It’s a carryover signature style that Lulu has had in rotation for a long time, and for good reason! It’s smooth, seamless, soft, flattering, and wicks sweat. I would recommend it to any activewear lineup; it’s an excellent staple to have! Sports Bra: Nike Pro Indy Dri-FIT Sports Bra ($45). Another staple I’ve had for years is this tried-and-true sports bra. It doesn’t offer tons of support if you’re on the larger side, but if you’re small like me, then it’s awesome, secure, and supportive enough for running. Shorts: Tracksmith Waban Short ($70). I was introduced to these super luxe shorts through my work, and I’ve become obsessed. They’re seamless, smooth, and have a really nice built-in liner so you don’t have to worry about underwear. Also really digging the wine color, super chic right? Not my usual neon pink and seafoam combo. Shoes: Nike Lunarglide 7 ($125). If you’re a “serious runner” you might be rolling your eyes, but you know what — Nikes have carried me through four half marathons, injury free. I have nothing against other running shoes, and I plan to try some (like Asics, Brooks, and Adidas) for my longer runs here in the city before my next half at the end of July. But I started with Nikes, they worked for me, and I didn’t want to mess with a good thing. Lunarglides are among the most stable, supportive shoes that Nike offers, and I love how they feel for distance runs. I loved participating in a race that was sponsored by one of my favorite brands. And running with #TeamSuja, I was able to fuel up and stay healthy before and after the race with lots and lots of juice. Yay fruits and veggies! The charity affiliation with this race is quite close to my heart. Without getting too much into my religion and background (most of you know I’m Catholic), I grew up with a love of the St. Jude charity. It was my grandmother’s favorite, and thus, one of mine as well. St. Jude is the patron saint of those who are lost, forgotten, and in despair; the charity focuses on children’s cancer, and caring for sick children. Because my race entry was free thanks to my team sponsorship, I used the money I would’ve spent on entry to donate to St. Jude’s. I’m not saying this to toot my own horn or make myself look good (omg everyone I’m so charitable and nice look at me); but I think it’s important to remember how lucky we are to have our health, and if we can do something for those who are struggling — even just by running in their honor! — then we can make a difference. I get emotional on races. I know I’m not the only one. There’s a lot of stuff happening. But I struggled SO hard to fight through a full on breakdown when we got to mile 5, in which was the Wear Blue Mile in honor of fallen military. My throat was closing, and I was choking back tears. Some runners were wearing blue shirts, with a photo of them and their dad, brother, son, sister — “I’m running for my dad.” These people died so we could do things like run a race in the middle of the street — without any fear of harm. For each of the 125 soldiers, there was a person on either side of the street holding up an enormous American flag in their honor. I looked to my right and realized some runners had been carrying a large American flag while completing the race. I can barely run a half marathon with two free hands — I can’t even imagine doing the whole thing, or a full marathon, carrying a large heavy flag. It was awe inspiring, powerful, moving, and made me grateful to be an American. 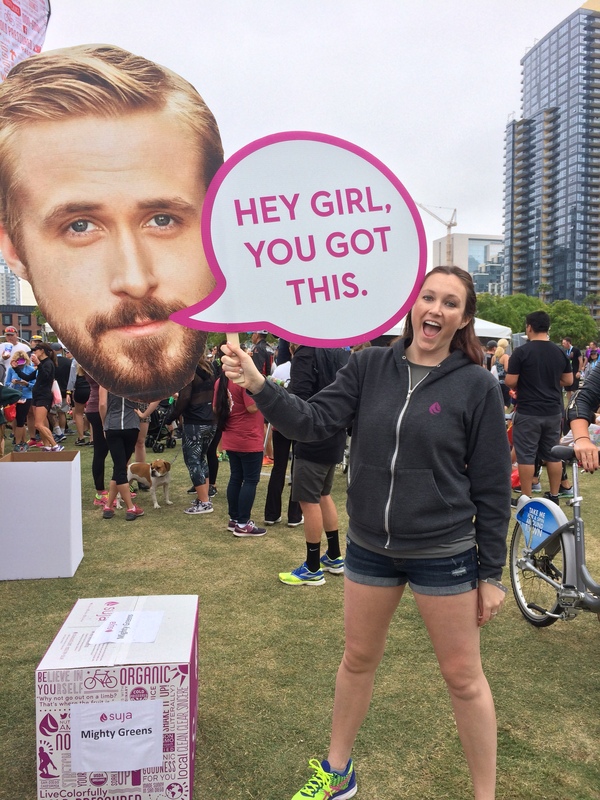 On a lighter note, my friend at Suja had these insane Ryan Gosling cutouts made, as well as Zac Efron, Michelle Tanner, and Elle Woods. They were AWESOME. said friend, who is a legend, a hero, and a benefactor to society. Katie, the world appreciates you. 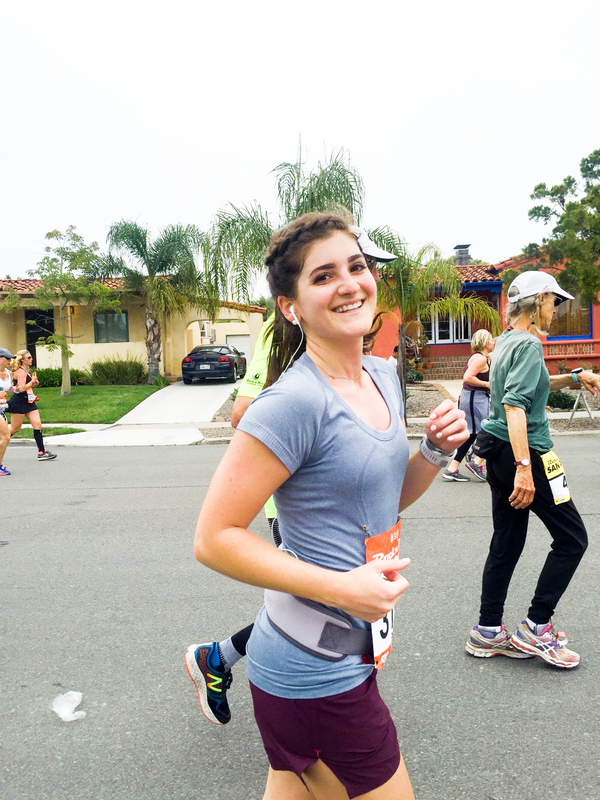 The people who come out just to support runners — runners they don’t even know — are among the most special and most underappreciated members of our communities. The people who get up early to watch and cheer, to smile at people when they’re on the brink of fainting, to create a “tequila station” just past the electrolyte station and give free Patron to runners on mile 6 (did not imbibe but appreciated the gesture), and to make signs for people they’ve never met, and from whom they’ll likely never get a verbal “thank you.” Each of you are heroes. It is my goal to interview you and find out if you are actually a human or an angel disguised as a person. I’ve yet to run a race solo, and to be honest, I don’t know if I ever want to. Having a friend or loved one to share in that experience with you is seriously special, and gives you so much strength. 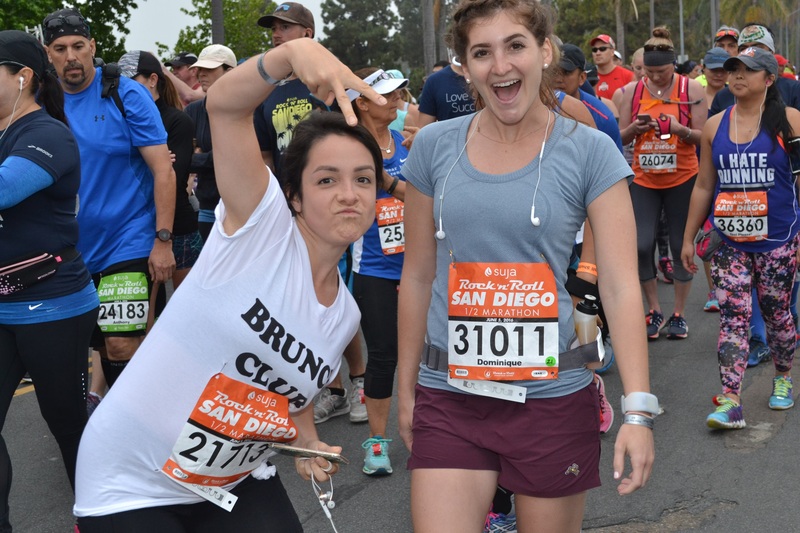 This was the second race that Arielle and I ran together, as many of you know, and I can’t tell you how much she helped me get through those last miles! 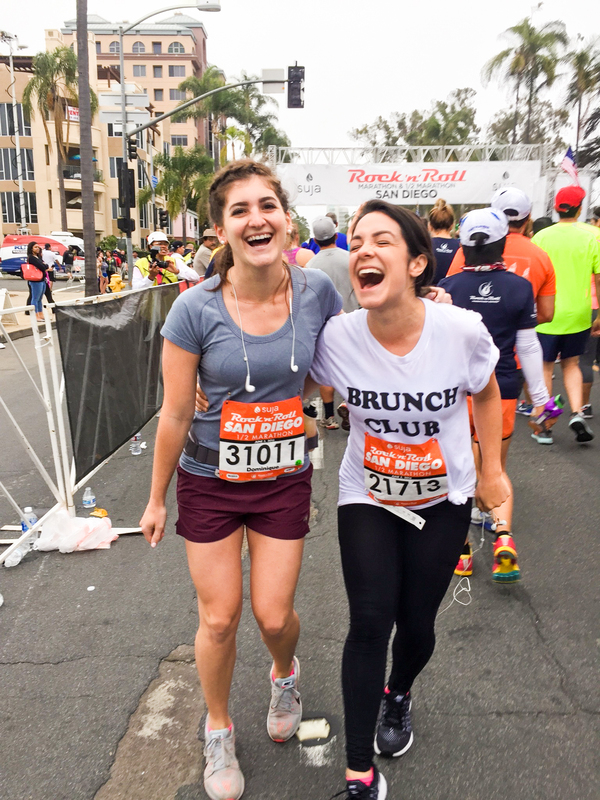 I felt my knees, ankles, and toes more than ever around mile 11, and then a spunky, peppy little firecracker in a “Brunch Club” shirt turns around and says “GO! YOU GOT THIS! LET’S GO!” That kind of encouragement (if not outright drill-sergeantry… not a real word just go with it) pumps you up more than a playlist, more than on course entertainment. June gloom in San Diego has pissed me off for decades, but this time around, I was grateful. How the tables have turned! The early start time + marine layer + cooler early summer temps made for a surprisingly comfortable run. 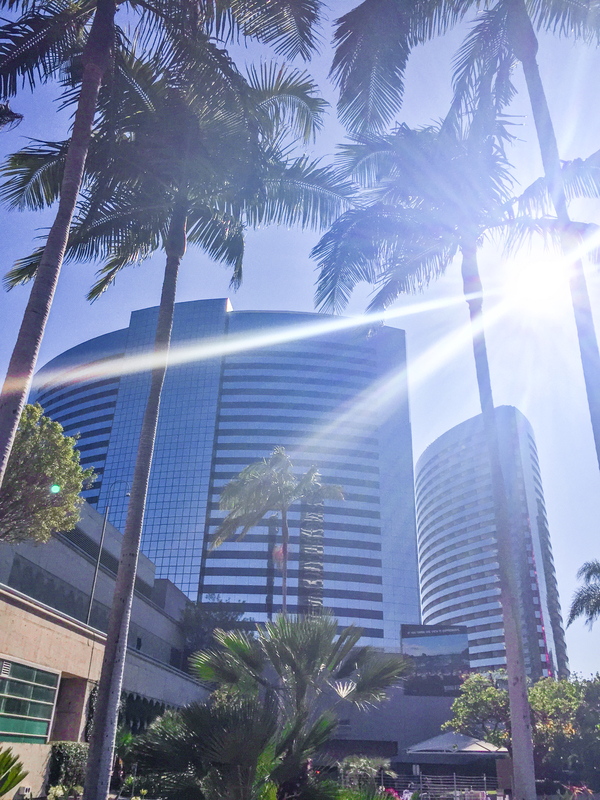 Despite warnings that San Diego was expecting an unusually warm weekend, the weather rivaled San Francisco’s. So, the sad part about this is that Arie and I were so unbelievably dead at the end of the race, that we didn’t make it to the full finisher’s village, which was devastating, because Suja had this badass 180 camera and it looks like THE MOST FUN and we would’ve had some great pictures. Alas, this is the price you pay for not training properly. The HAPPY part is that my parents were at the finish line, which was super awesome. 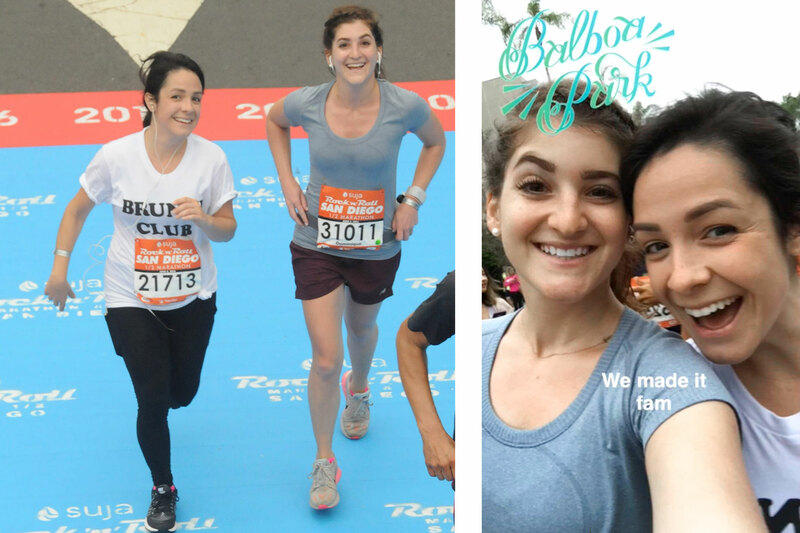 It always feels great to cross the finish line and relish in your accomplishment and be proud of yourself, but when there are other people there to be proud of you, too, that feels pretty fantastic. My friends Hailey and Melanie joined us for the post-race brunch, which is one of my favorite ways to celebrate with friends and family. MMMM FOOD. Given that our hotel was a stone’s throw away from Little Italy in San Diego, we naturally opted to carb load (for dinner) at an Italian joint. The pasta was super delicious, and there was bread aplenty. I got some chicken scallopini with capellini, and also ate some of Katie’s gnocchi. Heads up, our service took over an hour to get food, which was not ideal given the fact that we were shooting for an early bedtime. If you’re eating here before a race, build that into your schedule (maybe shoot for a super Italian style 4pm dinner). The brunch we ate prior was also carbs. Café Gratitude is a vegan restaurant, so naturally their specialty is carbohydrates in all forms. I indulged a lot (*shoooocking*) and got the berry french toast “I am Thrilled,” which tasted like a delicious berry cheesecake. Heaven. Arielle and Katie opted for veggie burritos, which I ate parts of and enjoyed quiiiite a bit. Not to be tooooo graphic, but you don’t want to be stuck at the start line of a race in desperate need of a port-o-potty because you haven’t ehhh… digested yet. If you’re familiar with said circumstance, you know how NOT fun it is, and you know that avoiding at all costs is PARAMOUNT. Arielle and I decided to take matters into our own hands by drinking coffee starting at 4am and pacing around the hotel room while rolling our feet with a lacrosse ball and using a muscle roller on our shoulders and back. It was actually a pretty nice way to wake up, except for the whole 4am part. Everything went according to plan, and we were able to get to the race with a peace of mind. And body. Breakfast consisted of a bit of Lavenade (yay for de-stressing! ), PB banana toast — chunky PB, Dave’s Killer Good Seed Bread, banana slices, and a BCAA post-workout drink I started drinking the day prior to prevent soreness. I have been drinking Arbonne Phytosport for a while now, and I still think it does a great job at promoting recovery. The drinking BCAAs the day or two before an endurance event is a tip I picked up from some random body-builder at the getting swole store, also known as The Vitamin Shoppe. Or perhaps it was GNC. Idk honestly. But it works, as far as I can tell! 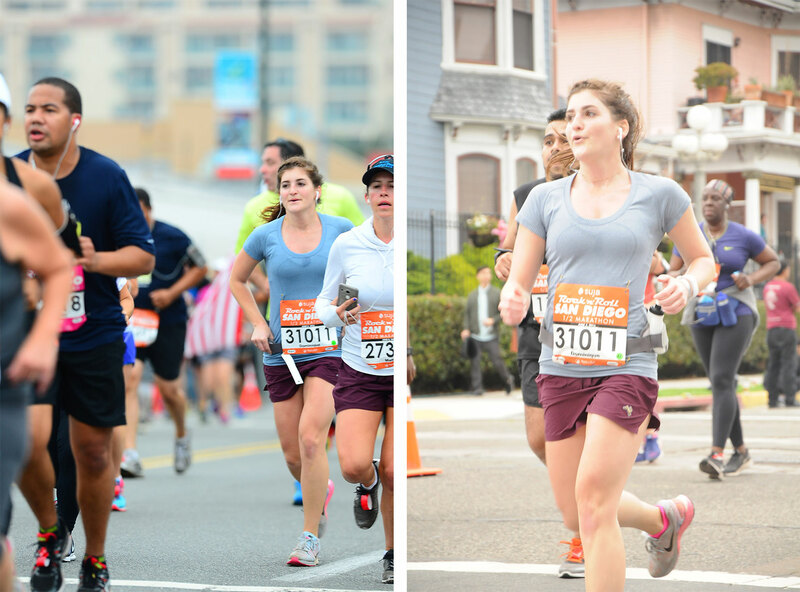 This was also the first time I’ve run a race and not been at home — even when I didn’t live in SF, we stayed in the family house, so we had groceries, a kitchen, etc. The hotel posed a bit of a challenge, but I think we pulled it off well by going to Ralph’s the night before. We definitely forgot about utensils, plates, a lack of toaster (sorry pb toast), etc, but still managed to make it work. Although I usually stay away from alcohol after a run, the cocktail menu at Rustic Root in San Diego was pretty irresistible. I sipped a peach bellini (one of my favorites) throughout the meal, after I had downed some of my trusty BCAA drink. I then proceeded to bury my face in an enormous waffle topped with fried chicken, plus a side of bacon, the lot drowned in maple syrup. It. Was. Divine. If I could ever recommend one post-race meal for the rest of forever, it would be chicken and waffles. Oh my God. Heaven. I can’t believe I ever questioned this meal. IT IS EVERYTHING. My parents watched in awe and potentially horror as I shoveled bites into my chipmunk cheeks and cleared my plate. As mentioned several times, my Arbonne post-workout BCAA recovery drink has been instrumental in my muscular recovery. I iced immediately after completion, and also made sure to eat a banana and drink a chocolate milk (and water) at the finish line, which is a tried-and-true trick I’ve been using at every race. I continued to chug BCAAs until I got to my full post-race meal, which was lots of protein and carbohydrates (and honestly, it was the most emotionally gratifying meal, which helps with the mental recovery…. I think). Before I went to bed, my friend Melanie gave me some lavender oil muscle gel, which I rubbed into every part of my legs, especially the IT bands. I stretched before becoming comatose (which was short lived since I had an early flight back to SF). 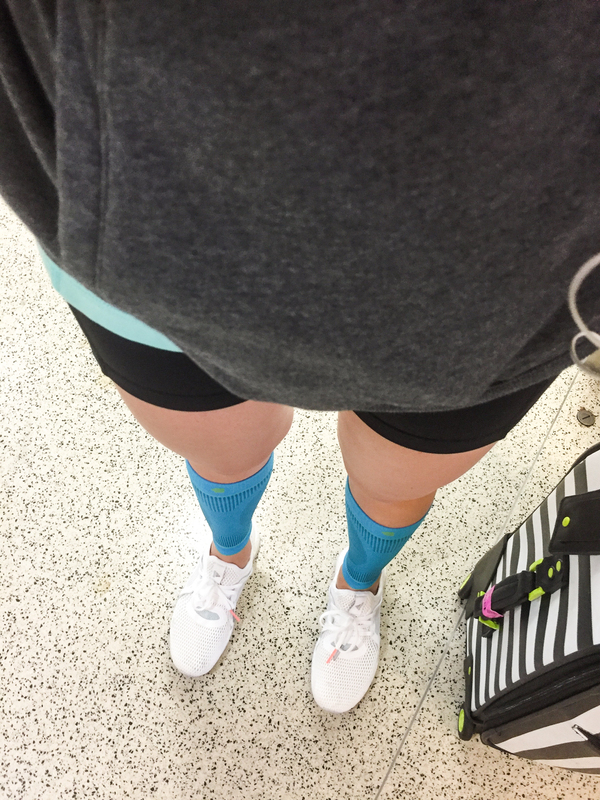 I wore my Bauerfeind compression sleeves to bed and on the plane the next day, which significantly helped calf soreness and circulation. In fact, my calves got so much relief, the only significant pain I was experiencing the next few days was in my quads and hamstrings. the actual unfortunate scenario that was my “travel outfit.” I think Who What Wear may have included this in their recent “what not to wear” piece. Once returned, I scheduled a massage (delayed one day because of Harry Potter Trivia Night — priorities), which helped tremendously. I continued to drink my recovery drink, stretch, take it easy, go to yoga, and walk it out. 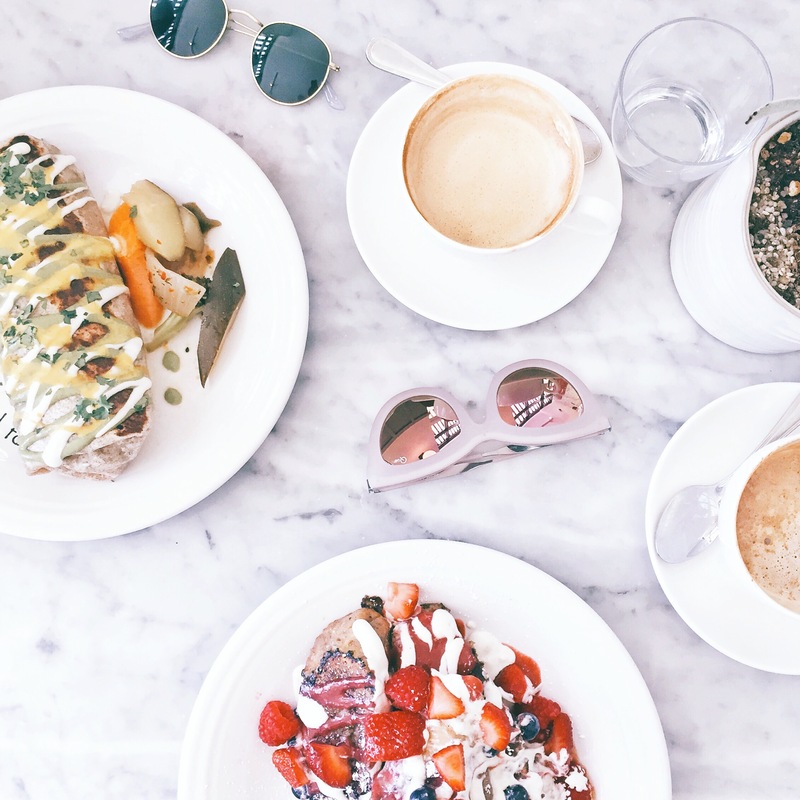 I was interviewing Harley Pasternak for POPSUGAR this past week, and outside of our interview, he told me I just needed to keep walking, and get lots of protein and carbohydrates. Done and done, celeb trainer! I also went with my team at work to Ritual Hot Yoga, which was a nice way to sweat, stretch, mediate, and recover. After a sweaty yoga session, I got a ton of sleep, and continued to rest for the rest of the week, skipping out on my usual daily workouts. I think that if I had trained, I wouldn’t have needed this much rest, but I’m not hurting anymore (less than a week later) which is pretty incredible given the situation. 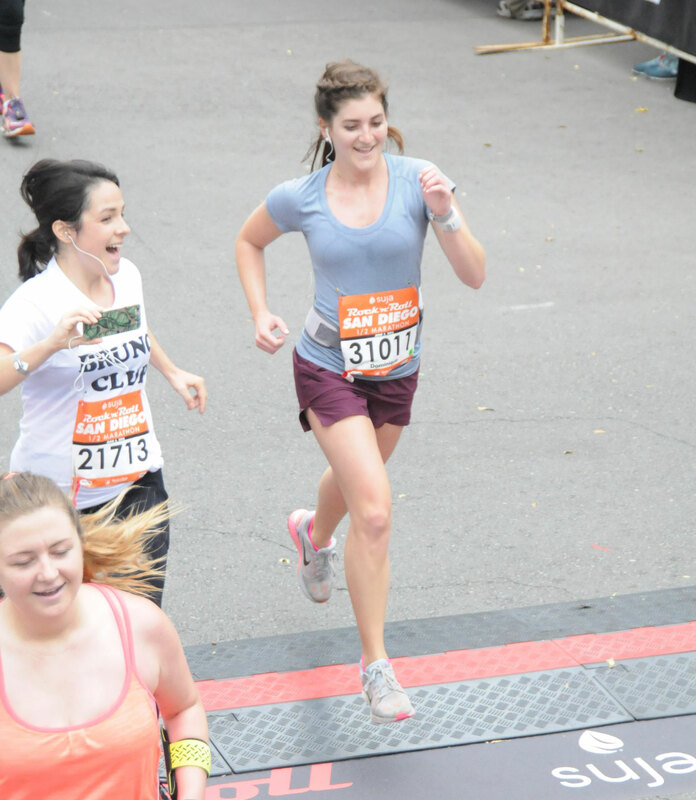 Despite the hiccups, this race was a huge moment in my fitness journey. I feel strong and capable — I mean, I can do 13.1 miles with very little training and STILL not die. WHAT? Never thought that would ever happen. I’m also so proud of my lungs for takin’ (13-point-) one for the team. They’ve come so far in the past two years, it’s almost like a got a lung transplant, but NO! That’s ME! I trained them, I trained myself, and I’m getting stronger, little by little. If I can do it, LITERALLY ANYONE CAN. Get out there. Go after a goal. Do something that you never would’ve considered. Surprise yourself! I surprised myself, and it’s one of the best feelings in the world. See you in July for the SF Half. A massive thank you to Suja Juice, especially Katie, for putting together an incredible event, and for letting me be a part of #TeamSuja. You are all wonderful people, and a phenomenal brand. Making San Diego proud! 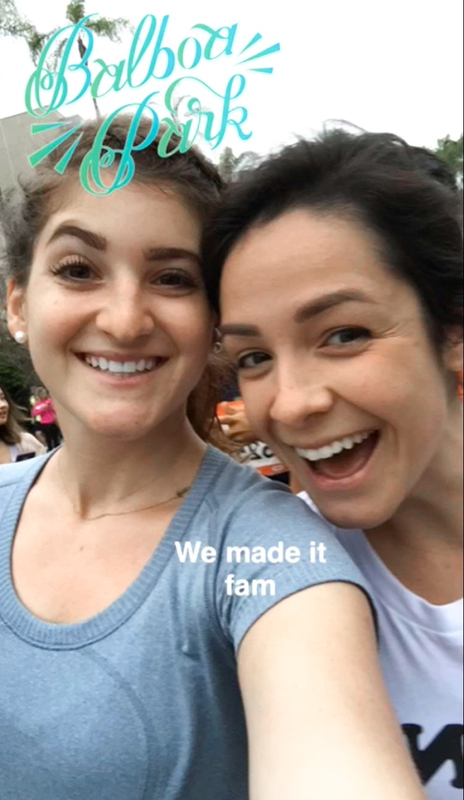 Thank you to Arielle, my running buddy and life partner; thank you to my parents for coming all the way down, fending off traffic, and acting as cheerleaders/emergency first-aid /brunch patrol; thank you to Hailey and Melanie for coming down to eat chicken and waffles and bacon with us. Thank you Bauerfeind for the compression sleeves — my calves love you.